The OMB Spring 2018 Unified Agenda has been published, with new estimated dates on action for EB-5 regulations. 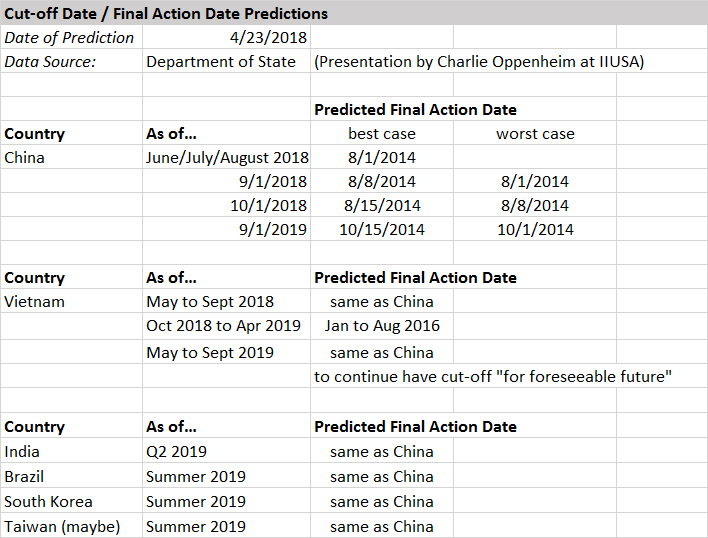 It remains to be seen whether these new estimated action dates will be more reliable than previous deadlines. RIN 1615-AC07 is currently a Proposed Rule at Step 7 in the Rulemaking Process, and is not yet listed by the OMB as a Regulatory Action Currently Under Review for Department of Homeland Security. Speaking at the IIUSA conference on April 27, Kathy Nuebel Kovarik of the USCIS Office of Policy and Strategy “reinforced her department’s position that they will try to get EB-5 regulatory reform done this year, as indicated on the Unified Regulatory Agenda.” This came on the heels of a letter sent by Senators Grassley, Goodlatte, and Leahy to DHS urging the administration to finalize regulations (repeating calls previously made in 2015 and again in 2016 and again in 2017). This week, IIUSA sent an open letter to USCIS encouraging the agency to finalize the proposed EB-5 regulation, but with lower investment amounts ($1 million, or $800,000 in a TEA) than previously suggested. However, the forces against finalizing the regulations remain strong (administrative inertia, and the many stakeholders opposed to the proposed changes). We shall see what happens. The OMB notices indicate that IPO has hired a new Chief of Policy (Edie Pearson), which is good to know. FYI, my May 2017 post New EB-5 Regulations: Comments Discussion reviews the proposed regulations and industry response. USCIS has picked up the pace on I-526 adjudication. 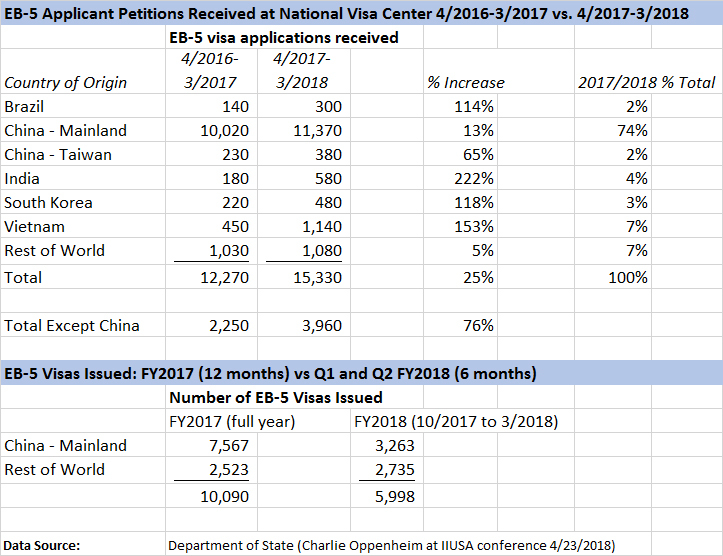 The National Visa Center received 25% more EB-5 applicant petitions in 2017/2018 than 2016/2017. That reflects I-526 processing improvement (good news), and results in more people ready to claim available visas (bad news for the visa backlog). Visas can be issued by Department of State through consular processing (for applicants residing outside the US) or USCIS through I-485 status adjustment (for applicants in the US). Historically most EB-5 visas have come through DOS, but we’re seeing a steady increase in visas through status adjustment: 991 in FY2015, 1,442 in FY2016, 1,676 in FY2017, and 952 already in the first six months of FY2018. This reminds us to keep an eye on what’s happening at USCIS as well as DOS, when tracking visa number demand. Consider the lesson from China. EB-5 was still current for China throughout 2014; Chinese applicants didn’t start getting held back with a cut-off date until May 2015. But Chinese investors who filed I-526 back in FY2014 have been affected. Applicants with 2014 priority dates started getting visas in September 2015 (per the Visa Bulletin) and will still be getting visas into 2019 (per Mr. Oppenheim’s predicted final action dates). That’s a lot of years just to issue conditional green cards to petitioners from one year. 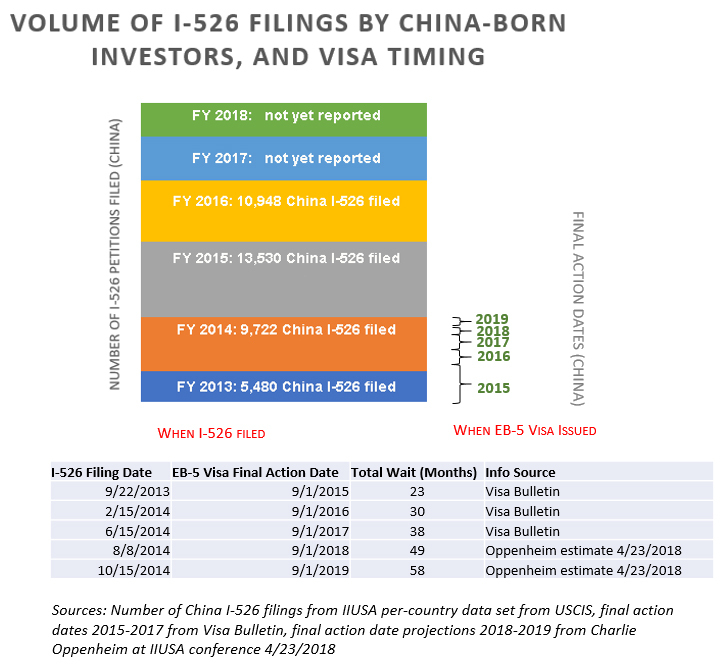 Look at 2014, and then visualize how many years it will take to issue the visas to Chinese who filed I-526 in 2015, 2016, 2017, and 2018, unless something changes. (See my graphic for visual reference.) If Chinese with 2014 priority dates are still in line for visas into the end of 2019, how long will a Chinese with a priority date of today have to wait for a visa? That tower of past petitions is a sobering fact for China, and also any potentially high-volume countries that may end up in line behind China. The prospect of unacceptable wait times creates urgency to advocate for more EB-5 visa numbers. As things are, we can’t keep attracting every year three to four times the number of investors who could eventually get visas in a year, or depend heavily on any one country given the per-country limits. FYI, of people who’ve filled out my I-526 processing experience Google form so far, a majority of those with approvals in 2018 had priority dates in 2016, and some even in 2017. (Form results here.) Apparently IPO isn’t simply processing petitions from 2015, as the published Processing Time Information would suggest. The Bureau of Labor Statistics has made its annual Spring release of employment data for the previous year, which means a new data set for calculating Targeted Employment Area qualification. Impact DataSource explains what changed. To learn more, consider signing up for a webinar. Speaking of webinars, note that the Council of Development Finance Agencies is hosting a course designed to provide a substantial practical introduction to EB-5. USCIS has attempted to clarify reporting for processing times, and succeeded in confusing me, at least, even more than before. Unfortunately I missed a webinar on this topic yesterday because even the emails were confusing, but here’s what I think I understand, having read the new pages at egov.uscis.gov/processing-times/ and egov.uscis.gov/processing-times/more-info, and used my spreadsheet to fiddle with the EB-5 form numbers in comparison with numbers in the old-style report. USCIS has changed its method for calculating processing times for four forms: N-400, I-90, I-485, and I-751. The underlying method for calculating (and underlying reality behind) times for I-526, I-829, and I-924 has not changed. What’s different for the EB-5 forms is that USCIS now reports three pieces of information: a high and low month in an “estimated time range” and a “case inquiry date.” The low month in the time range corresponds to the date USCIS previously reported for “processing cases as of…” in the old-style report, while the high month multiplies that duration by 1.3, and the case inquiry date more-or-less corresponds to the high month. Apparently IPO doesn’t want people complaining that they’re outside of normal processing times until their cases are taking 130% longer than average. If you took part in the webinar and have additional insights or corrections, please share. The Visa Bulletin for April 2018 confirms that Vietnam is definitely up next month for a cut-off date based on oversubscription. With visa availability being the major political and practical factor for EB-5 today, I’ll be writing more about this soon. …In early March, IIUSA was pleased to join a group of industry organizations to review and discuss a bicameral compromise draft proposed by Senate and House Judiciary Committee Chairmen and key members of House and Senate leadership. After additional revisions were made to the compromise draft, IIUSA’s Board of Directors voted overwhelmingly to support the bicameral compromise that would have offered a six-year reauthorization and much-needed reforms. Unfortunately, the compromise reform and reauthorization legislation failed to garner the support of all industry organizations and failed to be included in the omnibus appropriations legislation. We are extremely disappointed in this missed opportunity but are most appreciative of the House and Senate Judiciary Committee leaders and members of Leadership who worked tirelessly to delicately craft the compromise package. The omnibus legislation, however, does include an extension of the current EB5 Regional Center Program through September 30, 2018. We plan to continue to work diligently with Congress and our membership to build on the compromise draft legislation. This post summarizes points in favor of the proposed EB-5 Reform Act. Its details and compromises won’t please everyone, as discussed in my previous post, but it is a piece of EB-5 legislation currently without a better alternative. Here are some reasons for stakeholders be happy if it gets included in the spending bill due by March 23. All EB-5 investors: The bill gives desperately-needed protections and options for investors in case of change with projects and regional centers, and improves and compresses the process for removing conditions. Future investors: The new investment amounts are high, but much lower than they could’ve been, or will be if the regulations are finalized instead. Visa set-asides offer hope (if no more) to potential investors from backlogged countries. Future investors will benefit from new process improvements, investor protections, and integrity measures. Regional Centers: A more difficult and expensive life under the EB-5 Reform Act is better than death from loss of RC program authorization. The five-year program extension will provide much-needed stability. The moratorium and transition period will be rocky at first, but should result in a more-clearly-defined program eventually. The visa set-asides will help with marketing, at least for awhile, and the new incentive categories broaden the kinds of projects that may be viable to market. The new investment amounts are not so high as to kill demand entirely, unlike in the regulations. And the bill opens up a new category of potential demand: investors who already filed with someone else but now want to switch projects and/or regional centers — something not previously allowed. People who want program integrity: This bill proposes integrity measures that mostly appear possible to implement (unlike previous drafts that would have made good-faith compliance near-impossible in practice, and thus not been effective in weeding out bad players either). And it offers funding, personnel, and official authorization for effective compliance initiatives already started by USCIS. People who want to tighten TEA incentives: This bill puts responsibility for incentive-area designation with USCIS, which will be more narrow, rigorous, and consistent than states. It’s naturally difficult to incentivize investment in significantly distressed and remote areas, and such areas would be at least as competitive under the EB-5 Reform Act as they are now. It’s too late for major changes and amendments if the EB-5 Reform Act is to get into the omnibus at all, but if I could propose one amendment it would be this: a period of at least weeks before the provisions take effect and the filing moratorium begins. Most stakeholders haven’t even seen the bill text yet, and it will be very hard to comply instantly if it goes into effect instantly. With three years to work on drafting EB-5 legislation, why did Congressional negotiators keep this most recent EB-5 bill hidden until the very last minute, and provide even IIUSA only a few hours to read it and respond? Possibly because this “Immigrant Investor Visa and Regional Center Program Comprehensive Reform Act” is a tissue of minority hand-outs, declawed reforms, poison pills, and half-baked good ideas. We’re to conclude “This is our last chance to get significant regional center program authorization, and it’s too late to make changes now, so we have to support this, no matter the details.” I understand, but oh those details. I am ashamed of this bill, and on behalf of the people behind it. How did years of negotiation produce this document? The media, pro-reform lawmakers, and the good proportion of EB-5 stakeholders left out of compromises will not be kind to those who drafted this bill, if it passes as-is. The TEA reform in this bill is calculated to avoid unduly incentivizing investment in distressed areas. In three years of EB-5 legislative proposals, each version has had a softer TEA proposal than the last. This one reduces the monetary incentive to a hair, compensates with incentives that will either be impotent/unrealizable in practice (visa set-asides, premium processing) or positively counterproductive (lower jobs requirement for needy areas? ), broadens the definitions of what qualifies as an urban distressed or rural area (e.g. switching from the NMTC “severe distress” criteria in previous proposals to just the NMTC low-income criteria, and no specified limit on gerrymandering), and adds new incentivized areas for a special few (closed military bases, U.S. territories, infrastructure, franchise investment funds). Congress was originally energized for EB-5 reform because they didn’t like seeing most EB-5 dollars flowing to already well-capitalized projects in already well-capitalized areas. That status quo has little to fear from this legislation. Luxury real estate will keep its top spot if this passes, and we’ll still have Chuck Grassley and the media shaking their fists. The bill offers real estate projects an extra gift for good measure: construction jobs can be aggregated and counted as qualifying direct permanent jobs regardless of duration. The integrity provisions in this bill are calculated to avoid making life difficult. Gone are the suggestions in past bills about involving third parties in oversight or reporting or requiring account transparency or fund administration. Here, integrity measures focus on internal certifications of compliance to the best of the certifier’s knowledge. That’s good for honest players who can do without burdensome and intrusive regulation, but also little limit on bad players happy to self-report compliance. Such teeth as the bill has — site visits, audits, background checks, termination threat — are largely things IPO is doing already, though I’m sure they’d appreciate the official authorization and extra funding. But generally, I’m not sure this bill will satisfy lawmakers who wanted EB-5 reform to combat fraud. The bill retains integrity measures that conveniently double as anti-competitive measures. The bill keeps a previously proposed annual regional center fee – lowering the amount for the largest regional centers and keeping it high for the smallest. It is more severe than previous proposals on involvement by anyone with foreign government connection at any level, even in providing non-EB-5 capital to a job-creating entity. UPDATE: Re-reading more carefully, I see that I’m wrong about this one. The bill says that for four months after enactment, no one can file I-526 except for new investors in in-progress raises with an approved examplar. The bill even attempts to set aside 7,000 visas for these privileged investors, forgetting that the numerical limit for 2018 visas was already exceeded back in 2014. The approximately 92,000 people in line for an EB-5 visa. These people are already in for a long wait with an annual quota of about 10,000 visas, and the EB-5 reform act has set-asides that would reduce generally-available visa numbers to about 6,900 per year. The situation will be especially bad for people from China, Vietnam, and possibly India. Those people already in line didn’t plan to wait 17 years or so for conditional green cards — and neither did the projects accepting their investment. The bill does not include on-purpose retroactivity (it doesn’t make TEA, investment amount, or job creation changes apply to people who already filed I-526), but past investors will be severely affected by the visa set-asides, and potentially by new restrictions that affect regional centers and investment projects. Those hoping to raise EB-5 funds to benefit projects in rural or distressed urban areas. The new incentives are not better designed to benefit them than the current incentive structure. The new regional center fees and requirements are well-designed to put anyone out of business who isn’t raising funds from hundreds of investors for prosperous urban projects. Entrepreneurs planning to file EB-5 petitions in the near future for their own enterprises, and any regional centers planning to raise funds for a project without a pre-approved exemplar. The bill has a 120-day moratorium on filing new I-526 and I-924, followed by a transition period from day 121 to day 365 that limits the petitions that can be processed. The Investor Program Office. This legislation will be tough to interpret and implement. USCIS will have to figure out provisions that the bill hardly explains: the franchise investment fund idea, the provision that I-829 petitions based on investment in unrealized/failed projects are to remain valid, the new amendment and re-petition processes, the provisions that imply retroactive new requirements for past projects, and the effects on direct EB-5. The bill stipulates a 120-day transition period, during which USCIS can come up with new regulations and policy, new forms and supporting processes, a new TEA designation process, and a new premium processing option. Hahahahaha. 120 months would be more plausible, considering past experience. Regional centers with fewer than 20 investors annually. They’ll face a $10,000 annual fee and a list of new compliance certifications that will be hard work if taken seriously. EB-5 projects with any foreign-government-entity-related funds in the capital stack, or personnel at any level. End of rant. If I wake up tomorrow to find that this has been attached to the House version of the new omnibus spending bill, then I shall transition to learning to live with it. And polish my resume, perhaps. In the meantime, USCIS approved a bunch of new regional centers. Probably most of these applicants filed I-924 back in 2015, little thinking what they’d be up against today! Additions to the USCIS Regional Center List, 02/02/2018 to 03/05/2018. 47 regional centers have been added. My Washington Updates page started the month of February full of anticipation. I thought we’d see final action for EB-5 regulations, because the Fall 2017 Unified Agenda said we would (having advanced the anticipated action date from April to February), Congressmen who might’ve been behind alternative legislative action (Grassley, Goodlatte) instead sent a letter in April 2017 urging DHS to finalize the regulations, USCIS Director Cissna committed in his confirmation hearings in May 2017 to finalize the regulations, and the few White House statements on EB-5 sounded warm to the proposed changes. So I was willing to bet that the February Final Action date would be met. But nothing happened in February, and now I wonder whether we’ll ever see action on these regulations. I’ll keep my eye out for an update in the Spring 2018 Unified Agenda just in case, but now that the initial impetus for action was quelled, I don’t know what’s left to counteract the overwhelming power of administrative inertia. The person responsible for drafting the regulations has left IPO (and Lori Mackenzie’s Policy Chief position was still vacant as of November 2017), the EB-5 industry has many problems with the regs as proposed, DHS would surely prefer to avoid policy-revising headaches associated implementing new regs, Chairmen Grassley and Goodlatte have bigger fish to fry, and who has incentive and energy left to push EB-5 program modernization? The proposed regulations could’ve had a devastating effect on my client base, particularly for direct EB-5, so I’m selfishly glad they weren’t finalized. But the process is still frustrating. I also started February with hope that Congress might manage immigration legislation, and that EB-5 could benefit from the expressed intent to redistribute some visa numbers in a way that privileges immigration by economically-successful people. But now here we are in March with no immigration legislation and no indication that there will ever be any. The last word I heard is that Congress may handle DACA – the primary impetus for new legislation — with its favorite cop-out: a short term extension attached to the next omnibus funding bill. Negotiations over immigration legislation apparently failed because Democrats really wanted DACA while Republicans didn’t want a border wall or to redefine the nuclear family as much as they wanted Democrats to fail with DACA. Now I see no prospect on the horizon for the two things EB-5 needs from legislation: more visa numbers to relieve the backlog and keep up with on-going demand, and a long-term extension of the regional center program. Would public relations allow Congress to achieve a long-term extension to the little-considered EB-5 regional center program benefiting wealthy foreigners if they simultaneously manage only a short-term extension for the high-profile DACA program benefiting US-raised kids? With DACA and border security having failed to sustain bipartisan immigration negotiations, what remains to bring people back to the table for a successful negotiation involving visa numbers? How likely is it that Grassley & co. will stop demanding genuine TEA reform as a condition for stabilizing the RC program, or that industry lobbyists will suddenly agree to make painful-to-their-backers TEA concessions? Who is there even to seriously advocate for the overall health and long-term stability of the EB-5 program, when most major users just need it a few more months unchanged to finish their own capital raises? I’m just sitting in my armchair in Utah reading the news, not on the ground in Washington D.C., but at any rate it’s tough to theorize change at this point. Here’s what I currently expect for 2018/2019: several more last-minute months-long content-free extensions to the regional center program, no visa backlog relief, and no change to the EB-5 investment amount or TEA definitions or other targets for EB-5 reform. But I’ll keep updating my Washington Updates page as I hear anything, and maybe I’ll be surprised by action. I’ve started a Washington Updates page off the Resources tab to keep track of what’s going on with legislation and regulations, and will revise it regularly as I hear about changes, in lieu of endless update posts. The page has details of regional center authorization (currently extended through March 23, 2018) and the immigration debate and new bills as they relate (or mostly do not relate) to EB-5. Do investor petitions fail when the project and/or regional center runs into trouble? Not necessarily, according to recent AAO decisions on EB-5 appeals. In August 2015, the SEC filed a complaint against Path America companies including Path America Kingco LLC and Path America Snoco LLC. The case was settled in August 2017, with the former Path America principal receiving four years in prison. 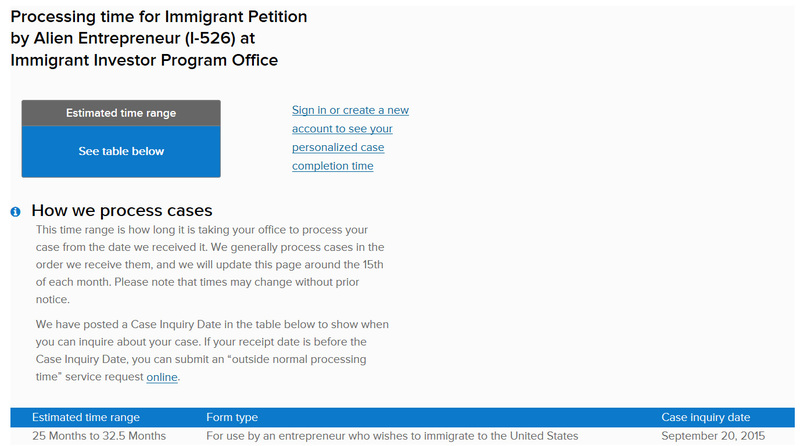 In the meantime, USCIS terminated Path America Kingco in March 2016, denied and revoked a bunch of Path America Kingco I-526 petitions starting in April 2016, and terminated Path America Snoco LLC in November 2016. Path America Kingco appealed its termination and was dismissed (JUN092017_01K2610), the PAK investors appealed their denials and were dismissed (e.g. DEC052016_01B7203, MAY112017_01B7203, JUL192017_01B7203), but Path America Snoco appealed its termination and was sustained (DEC212017_01K1610). PAK and PAS were terminated for malfeasance by the same former principal, but in the PAK case “he diverted proportionally more of the investors’ funds and the comparatively new management has only recently begun the process of renewing the project after its time in receivership.” AAO decided that PAS deserved to keep its designation because “the near completion of the project as proposed and the existence of a new owner committed to promoting future economic growth in the aggregate warrant maintenance of the regional center.” PAK has the same new owner, and the PAK and PAS situations appear to differ in degree more than substance, but at least AAO shows that it can give positive factors some weight. The PAS decision states that “There may be cases where, to maintain program integrity, the nature or degree of bad acts cannot be ameliorated or counter-balanced by positive factors of job creation and economic growth. For the foregoing reasons, this is not such a case.” Path America Snoco has been restored to the USCIS list of approved regional centers. The Palm House Hotel project has been the subject of numerous lawsuits and went into receivership in 2015. In 2016, EB-5 investors sued sponsor South Atlantic Regional Center and associated entities, alleging that the project was, in reality, nothing more than a façade pursuant to which their funds were stolen and distributed among the conspirators. However, the project has made some progress under the receiver, and at least two investors appealed their I-526 denials to the AAO (JUN132017_01B7203, JAN172018_03B7203). AAO denied the motions, but in a way that leaves open the possibility that the outcome might have been different had the petitioners presented better documentation regarding availability of funds to complete the project. Suzanne Lazicki is featured in the latest EB5 Investors Magazine as one of the Top 5 Business Plan Writers of 2017, and in a podcast with Mona Shah discussing business plans and the current EB-5 landscape. 10/30/2018: USCIS more or less laid this issue to rest with an update to the USCIS Policy Manual. Regarding redemption provisions only exercisable by the new commercial enterprise, the PM now states that “USCIS generally does not consider these arrangements to be impermissible debt arrangements,” with footnote to Kurzban’s Chang v. USCIS case. 6/13/2018: IIUSA has included helpful analysis of challenges to investment structures and terms in its letter from IIUSA to USCIS regarding Major Issues Facing the EB-5 Industry. FYI here are my notes for an ILW call on 4/17 to discuss the “invest” requirement, and new USCIS challenges to equity with debt-like features. The notes link to the relevant decisions and cases, and summarize the fact pattern and arguments for each case. 4/6/2018: Another lawsuit CHANG et al v. DEPARTMENT OF HOMELAND SECURITY et al (Case Number: 1:18-cv-00659). Here’s a summary and the full complaint. 2/9/2018: I’ve been alerted to a couple district court decisions that rule against USCIS in favor of EB-5 petitioners in cases involving call options. …The question in this case is whether United States Citizenship and Immigration Services (USCIS) acted in an arbitrary and capricious manner when it declared plaintiffs ineligible for visas because their investments came with a “call option,” which gave the company in which they invested the choice to buy plaintiffs out. Because the call option at issue here does not provide the investors with any right to repayment, the Court answers this question in the affirmative and grants partial summary judgment to plaintiffs… Unlike a sell option—or a note, bond, or similar arrangement—a buy option provides the investor with no security that she will ever see her money again. …A call option alone does not a debt arrangement make…. Every EB-5 offering is a balance between natural investor desire for a return and exit strategy, and EB-5 policy prohibiting debt arrangements between the immigrant investor and new commercial enterprise. (As a reminder, there’s no problem with debt between the NCE and job-creating entities in regional center offerings. The restriction is between the EB-5 investor and NCE.) People who prepare offering documents have to walk a fine line, and should note recent cases that help define where USCIS thinks that line lies. Article 9.1 of the partnership agreement provides that at any time on or after the date that a foreign investor’s Form I-829 has been adjudicated, the NCE’s general partner may, in its sole discretion, notify the investor of its desire to purchase (i.e. redeem) his or her interest. The purchase price will include 100 percent of his or her capital contribution ($500.000) plus all accrued and unpaid preferred returns. ….Preferred return is one half of one percent (0.5%) per annum on the total unreturned Capital Contributions [$500.000] of an investor. The fact that the general partner has the right to purchase or redeem, which the partnership agreement references as a “buyout right,” rather than the Petitioner having a right to sell his interest is not determinative. We previously found that a sell option was an impermissible debt arrangement regardless of whether it was enforceable. The “certain price” issue is the main leg to stand on for the December 2017 denials. (One wonders about the difference a profit-contingent preferred return would’ve made. Also, the leg still looks pretty weak, considering that the offering apparently lacks the defining feature of debt: fixed obligation to pay.) But the AAO appears to question debt-like elements generally. A review of the record as a whole reveals an arrangement where once the conditions on the Petitioner’s resident status have been removed, the NCE would likely redeem the Petitioner’s original capital contribution and pay him or her a modest “preferred return,” similar to an interest payment. Such an arrangement, though not characterized as a loan in the offering documents, contains the same elements (principal, interest, repayment period) that one would find in a debt agreement. Considering the partnership agreement and offering memorandum together, we find that the Petitioner did enter into an impermissible debt arrangement with an understanding that the general partner intended to repay the full investment plus preferred returns. This arrangement is not permitted under the broad language at 8 C.F.R. § 204.6(e) (definition of “invest”). As another example, consider APR182017_01B7203, a 2017 decision that challenges a “Priority Return” in a direct EB-5 offering. An arrangement under which funds have been contributed in exchange for an equity interest subject to a redemption agreement which provides that the investor may demand a return of some portion of his or her investment funds, including after obtaining conditional permanent resident status, is an impermissible debt arrangement, no different from the risk any business creditor incurs. For the alien’s money truly to be at risk, the alien cannot enter into a partnership knowing that he already has a willing buyer in a certain number of years, nor can he be assured that he will receive a certain price. Otherwise, the arrangement is nothing more than a loan, albeit an unsecured one. Having issued slightly fewer than the annual EB-5 visa quota last year, DOS compensated by going slightly over the quota this year. Vietnam and Brazil are the countries with greatest increase in EB-5 visas issued between 2016 and 2017. South Korea showed the largest drop. South America is the region with the greatest increase in number of EB-5 visas issued in 2017, and Europe the region with the greatest increase in number of nationalities receiving EB-5 visas. Compared with 2016, the 2017 report has more countries taking at least one visa, but fewer countries taking over 20 visas. Kudos to the brave lone souls from Angola, Cameroon, Bolivia, Bulgaria, Tajikistan, and Suriname who immigrated last year though EB-5. Countries besides China claimed 25% of the 2017 EB-5 visas (compared with 24% in 2016). There were 160 fewer visas based on direct EB-5 investments in 2017 than 2016. In addition to the Visa Office Report data on EB-5 visas issued during FY2017, we also have data on applications pending at the National Visa Center at the end of FY2017. 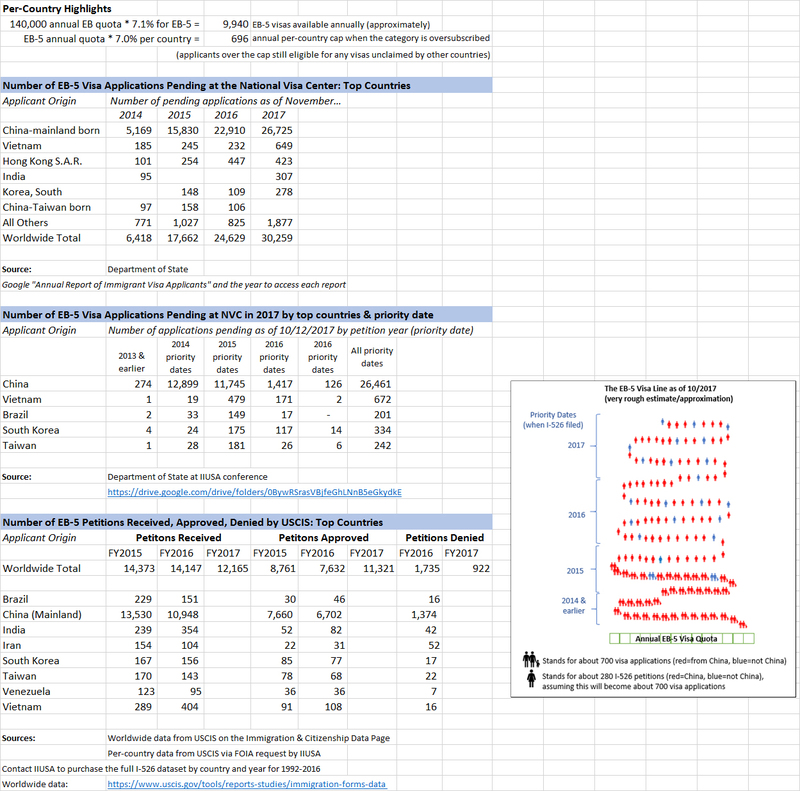 (I’ve copied a couple charts below, and you can consult the Visas tab in my master visa/backlog spreadsheet for additional detail and source links.) It’s puzzling to look at the different reports together. For example, one wonders why the drop in visas issued to South Koreans in 2017, when there were 278 visa applications for South Koreans left pending at the end of the year. Or why people from Hong Kong got only 81 EB-5 visas in 2017, when there were 447 Hong Kong applications pending in November 2016 and 423 still pending in November 2017. Vietnamese received a hefty 335 EB-5 visas in 2017, just behind China, but 649 Vietnamese applications were still left pending. 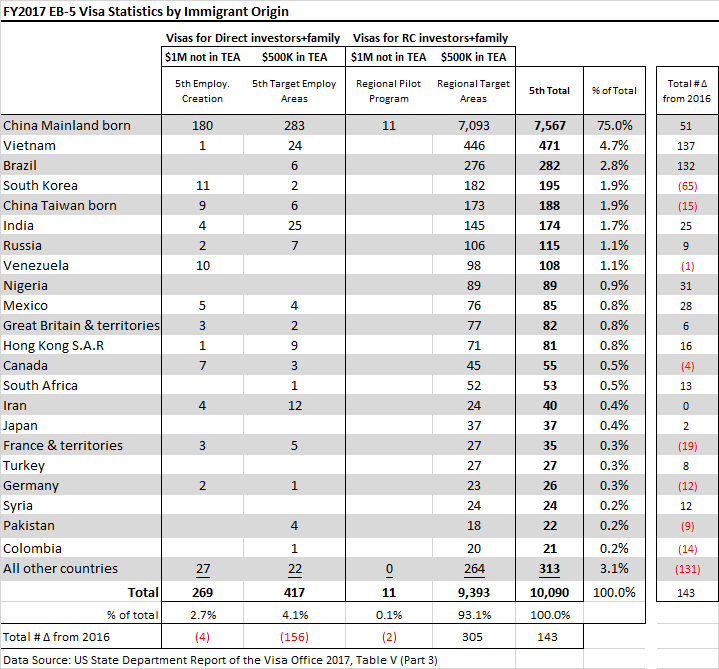 In total, DOS issued 2,523 visas in 2017 to applicants from countries other than China, but that still left 3,524 applications from countries other than China pending at NVC as of November 2017. Anyone know the story behind the non-China backlogs at NVC? For reference, here are my posts on the Visa Office Reports from 2016, 2015, and 2014. 7/28/2018 Per-country limits in question? My master Excel file of data related to the EB-5 visa backlog. See my Washington Updates page for ongoing updates. The President has signed H.R. 195: Extension of Continuing Appropriations Act, 2018, which puts the federal government generally, and the regional center program, back in business through February 8, 2018. The bill text was amended over the weekend, but no additions that would decouple RC program authorization from government funding. However, this extension just gives a couple weeks to breathe before the same issues need to be re-fought. Congressional leaders have vowed to use the time to come up with their long-promised immigration legislation. I hope that this will happen and include EB-5 (though EB-5 is still absent from all debate). Ideally legislation should precede and preempt the EB-5 regulations threatened in February. Update: Congress has cleared legislation to extend government funding to February 8, 2018. The vehicle is “Senate amendment to the House amendment to the Senate amendment to H.R. 195,” and I’ll link the text here when available. As we wait for Washington to reach an agreement that would fund the government and reauthorize programs including the regional center program, here’s a post from Carolyn Lee on what the shutdown does and does not mean for EB-5. The current lapse in annual appropriated funding for the U.S. government does not affect USCIS’ fee-funded activities. Our offices will remain open, and all applicants should attend interviews and appointments as scheduled. However, several USCIS programs will either expire or suspend operations, or be otherwise affected, until they receive appropriated funds or are reauthorized by Congress. The list of programs to be affected until reauthorized by Congress includes the regional center program. Congress lost its bet and failed to pass a new funding bill by midnight. But “lawmakers are believed to be negotiating a days-long extension that could be approved quickly.” In the meantime, the regional center program is on hold, and regional center-associated petitions and applications won’t advance until Congress takes action. The Hill has a new article every few minutes on the likelihood that Congress will or won’t agree on time to the CR extending current funding and associated authorities (including RC program authorization) into February. So much drama. I expect that the CR will pass by 11:59 pm on Friday, assuming that our lawmakers have much to gain from speaking out against the CR, and more lose from the shutdown that would result from not voting for it in the end. But we shall see. Just in case, Klasko Law comments on effects of a potential government shutdown on immigration processing and programs and IIUSA explains Possible Government Shutdown: What it Means for the EB-5 Regional Center Program. House Appropriations Chairman Rodney Frelinghuysen today introduced legislation (H.J.Res 125) to maintain current funding for federal operations and prevent a government shutdown. The Continuing Resolution (CR) is a stop-gap measure that will extend government funding through February 16, 2018. There’s nothing in the text of H.J.Res 125 to prevent regional center program authorization from being extended with other authorities tied to current funding. But we’ll see whether Congress can manage to agree long enough to pass the CR and avoid a shutdown. The White House supports the CR, at least. We hold these truths to be self-evident, that all men are not created equal, that they are endowed by their nationalities with certain inalienable characteristics, that among these are propensity to violence, noxious ideology, inability to assimilate, and failure in the pursuit of property. — That to secure against such characteristics inherent in certain nations and their nationals, immigration policy is instituted among Us, to effect Our Safety and Happiness by erecting barriers against threats embodied in Them, and screening Them by the color of their passports in lieu of the content of their character. Dr. King’s genealogy of racial segregation from his How Long Not Long speech in 1965 could also be recast to explain how and why our current populist movement has been co-opted into an anti-immigrant movement with such violent sentiment against DACA. It may be said of the new economy that the donor class took the world and gave the poor white man legal status. And when his wrinkled stomach cried out for the food that his empty pockets could not provide, he ate legal status, a psychological bird that told him that no matter how bad off he was, at least he was a citizen, better than the Illegals. We miss you, Dr. King! January 19, 2018: The next regional center program sunset date (and the deadline for a new funding bill that some hoped to make a vehicle for sweeping new immigration legislation). It’s looking likely that this deadline will be pushed back a few weeks, however, with another continuing resolution. The race is on for EB-5 legislation, with pressure from sunset dates and the need to forestall unwelcome regulations. Washington is actually talking about comprehensive immigration reform, including reshuffling visa numbers. But I haven’t heard EB-5 mentioned once, for good or ill, anywhere, by anyone, in recent immigration discussion. The left is for DACA; the right is for border security and against diversity visas and chain migration. Immigrant investment doesn’t fit with any side’s talking points. I hope that Congress privately remembers EB-5, because we really need action from them: to give the regional center program a longer-term authorization, to enact program changes better than what would come with new regulations, and to realize program potential by freeing up more visas for EB-5. Update: For current status, check the Regulations Detail section of my Washington Updates page. While we have our eye on the legislation ball, the Office of Management and Budget has given us a new EB-5 deadline to think about. The Spring 2017 Unified Agenda had mentioned April 00, 2018 as a “Final Action Date” for regulations dealing with EB-5 investment amounts and TEAs (RIN 1615-AC07), but now the Fall 2017 agenda has advanced that prediction to February 00, 2018. I’d doubted the April date because so many factors seemed likely to delay regulations (the prospect of legislation instead, the fact that Congressional intent as expressed in draft legislation looks so different from what DHS put in the proposed regulations, the administration’s coolness to regulation in general, government inertia in general), but advancing the date to February looks like positive intent to really get the EB-5 regulations done. On the other hand, the threat of immanent regulations may inspire Congress/industry to finalize EB-5 legislation ASAP instead. 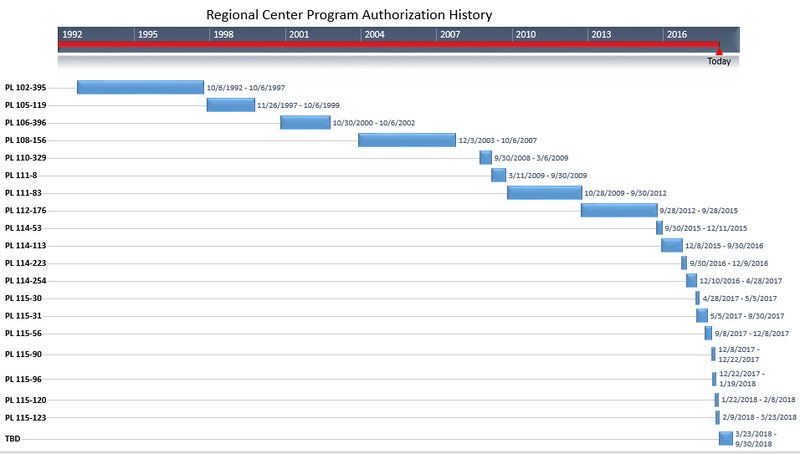 DHS is still in the process of reviewing potential changes it would propose to the regional center process. DHS may propose to implement an exemplar filing requirement for all designated regional centers that would require regional centers to file exemplar project requests. An exemplar filing requirement could cause some projects to not go forward, but DHS is still in the process of assessing the impacts on the number of projects that may be affected. DHS anticipates that any proposed changes to the regional center program would increase overall program efficiency and predictability for both USCIS and EB-5 stakeholders.